NEW YORK – Many companies pay lip service to workplace diversity, but few go as far as Coca-Cola, which aims to reach gender parity across all levels of its business by 2020. “It makes pure, good business sense,” Coca-Cola Chairman and CEO Muhtar Kent said Tuesday when discussing his initiative, launched in 2008. Coca-Cola Co., Alcoa Inc. and Unilever on Tuesday were presented Catalyst Awards for their global diversity strategies. The awards event, held at the Waldorf Astoria in New York City, focused on how other companies can get there too. “This is hard work. It doesn’t just happen because you want it to,” Kent said. Under Coke’s Global Women’s Initiative, senior-level positions held by women have increased to nearly 30 percent globally from 23 percent, according to the company’s records. Coke’s initiative extends beyond its doors to empower and train women in their communities. The Coca-Cola plan was triggered by company research that indicated that, globally, women make more than 70 percent of purchasing decisions related to its products. “We also made sure everybody understood the business case for it,” said Kathy Waller, Coca-Cola vice president, controller and chair of the company’s Women’s Leadership Council. Alcoa, the world’s leading aluminum producer, between 2008 and 2012 increased its female representation to 19 percent from 16 percent among executives, and to 25 percent from 22 percent for professional and plant manager roles. Those percentages increased even as the company cut its global workforce by 30 percent. “It’s an obvious business imperative if you want to outperform your competition, you have to bring in women,” said Glen Morrison, president of Alcoa Building and Construction Systems. Alcoa officials said they use outreach efforts and 10-percent bonuses, among other measures, for managers who meet diversity requirements to encourage women to join and stay at the company. Morrison said it’s critical for companies to create an environment where women can return after having children. “Otherwise you’re grooming this great talent and you’re letting it out of the workplace,” Morrison said. Janne Sigurdsson is an Alcoa success story. 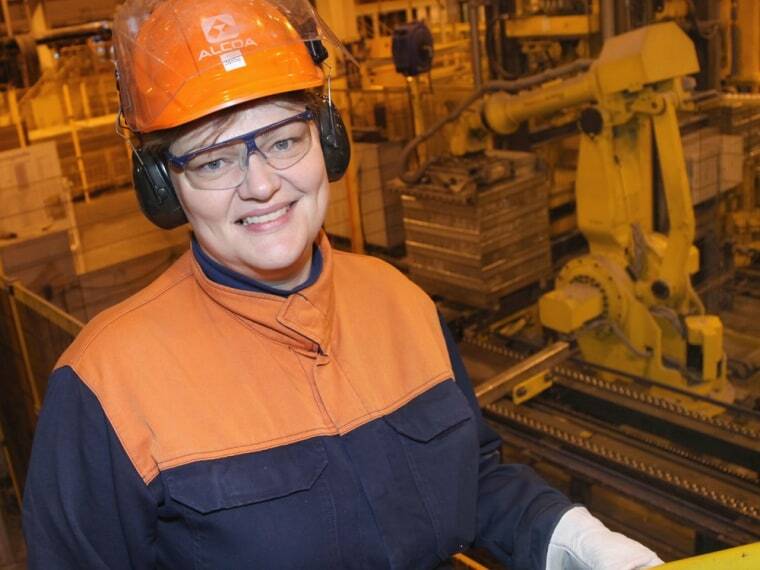 Hired seven years ago as the IT manager for a smelting plant in Iceland, she’s now running the smelter, which is Alcoa’s lowest-cost and most efficient. At her remote Iceland plant, 33 percent of the managers are women; overall, 22 percent of the workers are women. The goal for the plant is 50 percent. “It’s a tough goal,” Sigurdsson said. “You need to do something extra,” she said when asked how to hire and retain women. Sometimes it means sending promising employees back to school, or, as was her case, doling out encouragement to apply for a promotion. While she’s not always on the smelter floor, even office staff is trained to do dirty work when the power goes out at the plant, which operates 24/7. “I can change the anodes. I can do pot-tending. I can do that when we have a crisis,” Sigurdsson said. The Catalyst Awards were launched 1987 by the non-profit Catalyst group, which seeks to expand opportunities for women and business.